"Pickling" is a cleaning process used to remove the black oxide scale that forms on the steel strip after hot rolling. CSI offers a broad range of grades and gauges, with key emphasis on tight chemistry control and clean steel technology. Our offered gauges range from 0.065 to 0.250 inches, in widths ranging from 27 to 60 inches. All P & O product is processed through a modern pickle line that incorporates tension leveling, producing a product with a very flat shape and excellent surface. 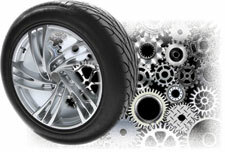 Typical applications which use pickled material include automotive wheels, strapping, tubing, rack systems, and automotive stamping. To purchase CSI's pickled and oiled products, or for more information about our hot rolled pickled and oiled products, please contact our Sales Department (see CSI Sales Support).